Over the past two decades, Blizzard Entertainment has had a tremendous impact on the world of games and global pop culture. From its humble beginnings as a three-person console-game development studio in 1991 to the creation of the blockbuster Warcraft®, StarCraft®, and Diablo® series, Blizzard has a history of crafting stunning worlds of science fiction and fantasy. The company’s distinctive gameplay and storytelling styles have captivated an international audience numbering in the tens of millions whose passion cannot be quelled. Twenty years after Blizzard opened its doors, the company’s World of Warcraft® boasts the title of the world’s most popular subscription-based massively multiplayer online role-playing game, and the studio is widely recognized as one of the leaders in creatively driven game development. An epic volume of art and behind-the-scenes insights, The Art of Blizzard® celebrates the studio’s genesis by examining the creative forces behind these games and showcasing their artistry through more than 700 pieces of concept art, paintings, and sketches. Commentary on the art is provided by Blizzard Entertainment’s own Nick Carpenter, Sam Didier, and Chris Metzen, who’ve each played important roles in shaping Blizzard’s game universes over the years. Weighing in at 8lbs, this is a coffee table book in the true meaning of the word; my knees went numb as I was reading it on my couch. Although, if you use the links above, it is hard to find a copy of this book for under $50, I found mine in the bargain priced section at Barnes & Noble, and if you want to splash out more money Insight Editions are selling a specially bound version. 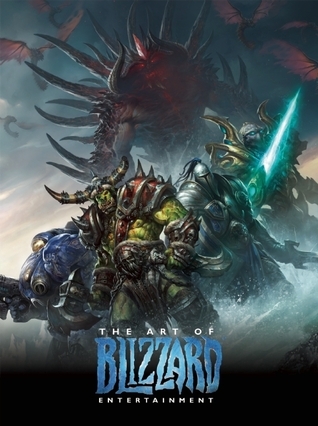 However, if you already own all of the Collector’s Editions of Blizzard artwork books, this is probably not a purchase you will want to make, as many of the illustrations featured in it are in the previously mentioned books. With over 700 illustrations this book covers the artwork from such iconic Blizzard games as Warcraft, Diablo and Starcraft, with accompanying commentaries by the artists themselves. It gives the reader a fascinating insight into the creative talents of the company as well as providing a visual history of Blizzard games. What I found particularly interesting about this book was how clearly apparent the evolution and refinement of the artists techniques became as time passed, it was almost as if I were seeing physical proof of their confidence in what they were doing growing before my eyes. Another aspect of the book I liked was the fan art submissions and how some of them were actually recruited into the Blizzard team. This book covers everything from the early sketches right up to the completed box artwork; one of my favourite in the Diablo section was the Mistress of Pain. Full of magnificent scenes and characters, what little text there is in this book has been thoughtfully placed so as not to intrude on the main stars of its pages, in fact in some places the writing is rather quite difficult to find and read. This didn’t spoil my enjoyment of the book in any way, but for anyone who has a visual impairment and wants to read the text for the back story to the images it may prove to be a challenge. However, this book does not just focus on the well know side of the company, in this book there is also a section with conceptual art for games that never were as well as a spoof chapter containing holiday themes using the more well-known characters. In reading this book you actually get a sense that you are in the same room with the creators, listening to them discuss, accept or reject ideas for the next project whilst also sharing with them a trip down memory lane. I would highly recommend this book whether you are a fan of Blizzard games or just a lover of fantasy art; this book touches all the bases..